Gable top packaging styles offer a distinct and clear design for retail products in the food, confections, wine and spirits industries. 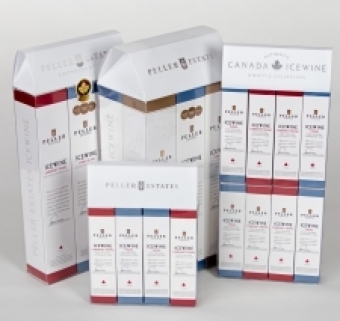 Usage/ Application: This style of carton is used in the wine and spirits industry, but allows for many other uses for a variety of retail packaging designs. Special features: The gable top style of transparent packaging makes for an attractive display or gift set retail box. This package incorporates a hand hole for easy carrying for your customer, semi-transparent graphics to not only showcase your product, but stand out visually on the shelf. Usage / Application: This style of carton can be manufactured to hold any size bottle(s), four, six, eight packs of wine, spirits or liquor as well as a wide variety of other products where a clear view to your product and brand are essential. Special Features: The custom branded header card ensures visibility of your brand, while the clear plastic folding carton allows visibility of your products. The gable top makes a unique display with the greenleaf locks offer extra closure security. Usage / Application: Gable style clear packaging coupled with a thermoform insert allows for the building of unique combination packs to showcase your products. In this case, the combo pack offers a transparent view to champagne, two champagne flutes and two tea candles. Special Features: Here, our customer has utilized a printed transparent gable top carton with greenleaf locks to combine offers for a gift set. The combination of products makes for a unique display and package on the shelf. Products are held in place by a custom plastic thermoform insert that does not detract from the packaging design. Packaging for unique designs, odd shapes and combinations of products can easily be created to your specifications for your clear plastic packaging. Special Features: This transparent gable top box features a cut out where the face of the plush character can poke its head through showing the soft texture of this character. The packaging design also incorporates a hanger for easy display on store shelves. Creating a 360 degree view of your product while still protecting it will attract consumers to your product on the retail shelves. Usage / Application: Health, beauty and pharmaceuticals are perfect for the gable top styled clear folding box or carton. Special Features: This gable top clear package incorporates printing on the plastic material directly, along with a thermoform insert for keeping products in place. It also includes a cut-out for hanging and will sit flat on a shelf as shown. Clearpak can help you design a breathtaking recyclable plastic folding carton that has great print and a outstanding visual presentation, sure to influence your consumer.